Looking back over the last two years, it is quite amazing to see what we have accomplished. For those who have not heard the story or for those who may have forgotten, after multiple conference experiences I returned to MSU with this thought: “How great would it be and how much would our science improve if we could replicate the excitement, the interactions, the networking, the science discussions, in essence “the conference effect,” back at MSU?” Although my first few attempts at creating such a group failed, The Pub Club, as officially begun in Fall 2014, was an instant success. For those of you who have participated at some point during these last two years, I want to say Thank You for helping to make The Pub Club the success it has been. This would never have been possible without your active participation and support. 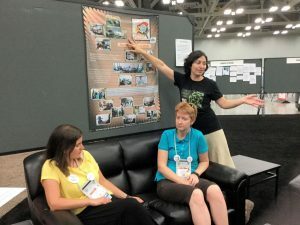 As a result of our success, I had the opportunity this summer to share the concept of The Community of Minds underlying The Pub Club at two major conferences. As I look forward to whatever is next for me, it will most definitely include finding ways to continue sharing this concept to the greater Science Community. With me graduating and moving on, the continued existence of The Pub Club “alphanode” on the 4th floor of MPS will depend on others in the group stepping into leadership roles and the majority of members committing to more consistent, active participation. With this in mind, I announced last week at the first Pub Club gathering for the Fall 2016 semester that I am officially stepping out of the “node coordinator” position for our group into a head coordinator, supervisory role. The reason for this decision is not that I will be too busy or that I do not see any possibility for additional return on the investment I have made so far. Rather, the best way I can facilitate a smooth, successful transition is to step out of the role of group coordinator into that of TPC director, an advisory, supportive position to manage the growth of TPC and to make room for those of you who decide to invest in your own professional development by committing to more active participation and leadership of The Pub Club. What is The Pub Club to you? What do you expect to gain, and what are you willing to invest to achieve it? These are some of the questions we discussed last Friday. For those of you who missed Friday’s gathering, and especially those who are considering stepping into a more active, committed role, I wanted to outline some of this discussion and provide you with some of the insight I have gained in my time leading the group that has proven essential in its previous success and will be just as essential to its continued success. As I mentioned, The Pub Club was the first successful effort in a series of failed attempts to build a Community of Minds. The previous attempts I made were requests to a couple of people to join me for coffee or pie or lunch. While one or two people did join me a couple of times, none of these attempts gained traction. The original Pub Club, while my idea, was first led by John Withers followed by Brian Kvitko. This version was run more like a journal club where participants would monitor assigned journals and report on new papers of interest each week. 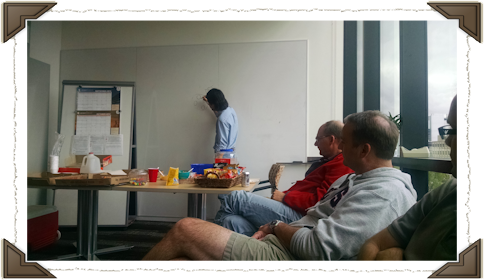 While it started strong, interest quickly dwindled, especially after deciding to meet only bi-weekly. So what was the difference that made The Pub Club 2.0 an instant success when it officially started in the fall of 2014? The short answer is Food, People & PI participation, but how was this accomplished? Did I have the whole structure and strategy planned at this point? Absolutely not! I literally took “the kitchen sink” approach. First, I requested floor members to contribute by leading discussions on different topics each week. 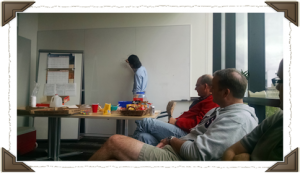 A look back through The Pub Club archives shows our first several meetings involved meeting highlights (Sheng Yang, Xiufang, James), an explanation of how grant panels work (Brad Day), rotation and exchange student introductions (Brian S., Megan, Mitch, Natalie, Habib), an intro to CRISPR (Ian), and a couple of career-related talks (Marcelo, Bethany). I made and posted flyers and also personally visited and invited all the professors and asked them to invite their labs. 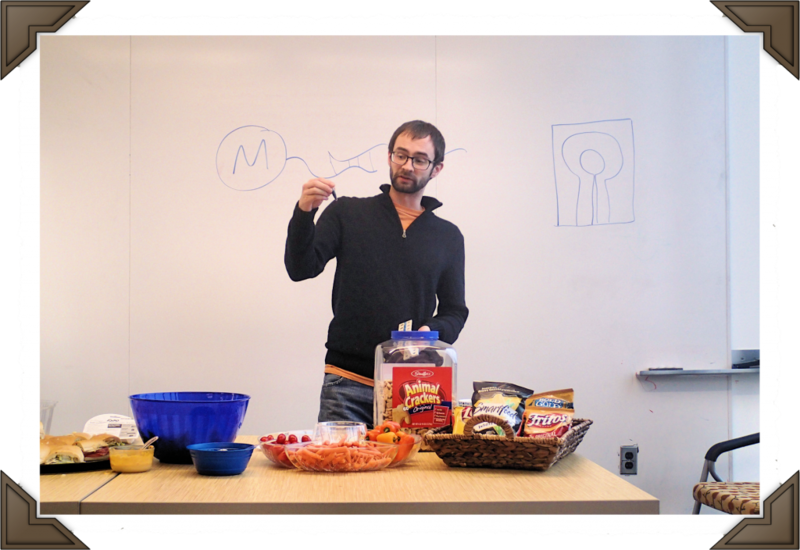 I brought in snacks that filled the floor with tempting aromas a couple of hours prior to the meeting. Finally, around meeting time, I walked up and down the floor reminding everyone it was time for The Pub Club. Did I know what I was doing? Barely! I just knew that I didn’t want to merely survive graduate school. I wanted to be a part of a greater scientific community, and so I did what I could to bring the people in my local sphere together to see what we could build together. So what is the evidence of success? Looking back at our attendance records, in the fall of 2014, our first meeting had 18 people and the average attendance that semester was 22. The following semester, we had a record high of 31 people and a weekly average of 18. While attendance is one measure of success, it cannot tell us why we were successful. 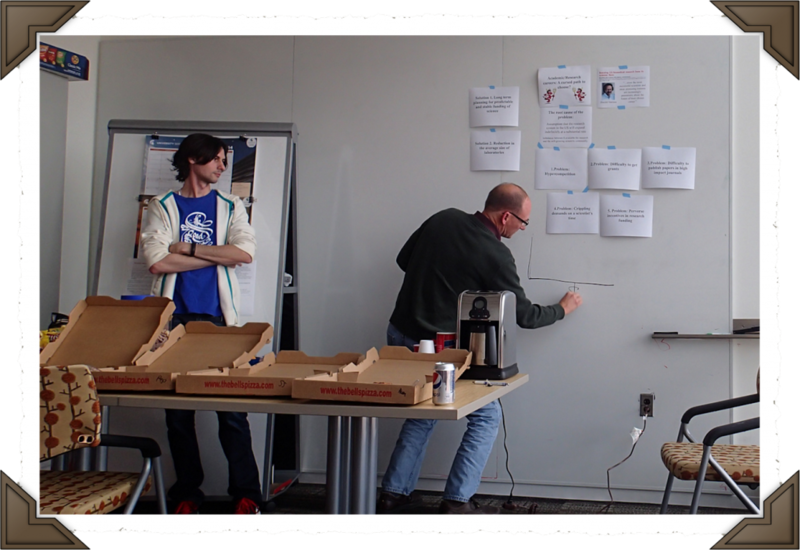 Last Friday, I asked our members to help me create a list of reasons why they come as well as reasons they don’t come. The list of reasons for coming was lengthy, including food (a popular reason! ), people, networking, informal environment, relaxed, casual, informal access to professors, relationships with peers, science updates, guest speakers, career advice, professional development and more. The list of reasons not to come was quite short, consisting of experiments, too many meetings, too tired and home/family time. In my reflections after the meeting I realized that a majority of the words in the first list are all attempts to describe the essence of what The Pub Club offers: Community. After creating these lists, we discussed what Community is and what function it fills. To borrow from Aristotle, a community is built on the smaller components of partnerships, such as families. A single family in isolation would be forced to spend all of their time securing their survival – food, shelter and defense. However, when families come together to form a community, these responsibilities are shared, thereby freeing up time for other activities, such as education, sports and the arts. The same is true with a Community of Minds. Each of us fighting our way through the academic and scientific process alone will be forced into survival mode. This not only makes the experience less enjoyable, it also severely restricts what we can achieve or produce. Food is an important part of building community, because “breaking bread” together on a regular basis helps establish and reinforce that comfortable, relaxed, informal environment to break down the natural barriers of unfamiliarity and enable the discussions that can only occur within the context of a community. It is within the context of this community that we are able to fulfill our two core mission objectives 1) Meeting on the Edge of Science and 2) Filling the Void. While the first mission was an obvious goal from the founding of The Pub Club, the second grew out of our gatherings. So what do these two objectives mean, and how does the structure of The Pub Club enable them? This is all about the science. 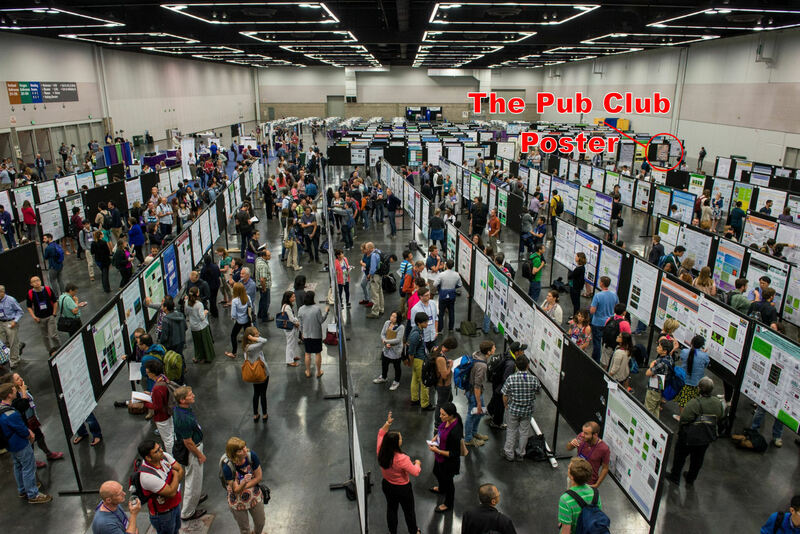 Science updates, including published papers (our own and others), new methods, RCR, troubles at the bench, conference highlights, Skype mini-conferences, guest speakers, etc. are all a part of us keeping up with the over-whelming information load, but is done in a relaxed, comfortable environment. 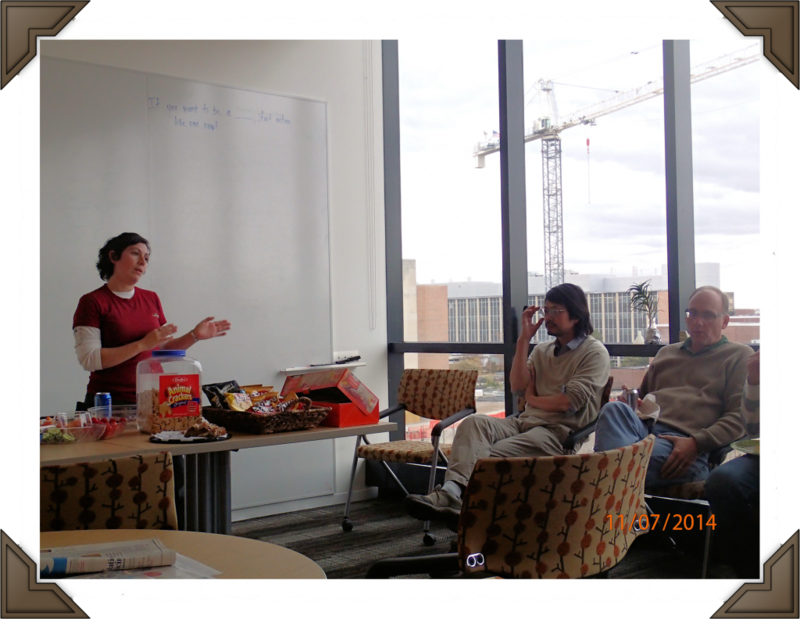 As conducting research can be a frustrating challenge a lot of the time, science discussions during weekly gatherings provide us the time and space to remind us why we love what we do and motivates us to keep at it. These conversations also involve offering suggestions, asking questions, brainstorming, and trouble-shooting with each other to help speed up the process and raise the quality of our science. Why struggle in survival mode when the person down the hall might have already found a solution to your exact challenge? Of course, these interactions are not restricted to Friday gatherings. As relationships are built and strengthened, we find it easy to seek each other out throughout the week. So what is required to keep this going? Member participation! One person cannot be expected to come up with the entire semester’s worth of topics and guest speakers. One person cannot be responsible to get snacks, set-up, and clean-up. It is all about the Community coming together to define the current interests and needs, and each individual doing their part to carry the responsibilities that makes The Pub Club available and accessible to all its members each week. It also takes a level of priority. If everyone only came the week they signed up to lead discussion or share their research, who would be there to listen? 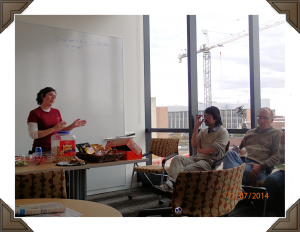 During our first semester, we had several career-related topics that exposed something we now call The Void. This term refers to the gap between the skills (both hard and soft) we have and the skills we need to be qualified and competitive for our careers of choice. Of course, the first step in filling The Void is identifying what is there. One way we have worked to accomplish this is by inviting guests like Beronda Montgomery, Shinhan Shiu, Rique Campa and Diane Ebert-May to talk to us about topics related to career, computational proficiency and scholarly teaching. However, just identifying what is in The Void does nothing to fill that gap. This is where the structure of The Pub Club plays a critical role. 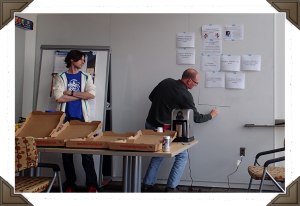 While spin-off groups like The Python Group have helped some of us gain new “hard skills,” each activity of The Pub Club, from weekly gatherings to summer BBQs, is designed to create opportunities to develop soft skills. Something as simple as signing up for snacks, which also involves set-up and clean-up, requires organization, planning, time management and budgeting. Leading a topic discussion develops your ability to research outside of your area of expertise, organization, oral communication, leadership and time management. Inviting and engaging with guest speakers facilitates networking, communication and builds our confidence in asking questions and engaging in conversations both relating to our work and others’ work. Regular, casual interactions with our PIs and our peers enables us to benefit from a broad spectrum of personal experiences that can inform how we think about our science, how we conduct our science and also how we can strategically manage our careers. Through active participation in this collection of opportunities we chip away at The Void one bit at a time. 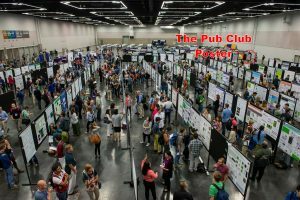 The Pub Club offers us a unique opportunity to be a part of a Community that strengthens and reinvigorates our science while providing invaluable professional development experiences. In writing this, my goal is not to convince you that The Pub Club is valuable; I know you are already convinced of that fact. My goal is to make clear what The Pub Club is, what is the underlying structure that defines it, so you will know what is required to maintain its value and its success. While I have carried the bulk of the responsibility alone these last two years, this is not a sustainable model moving forward. You will need a team of leaders and a core group of participants who understand and are committed to The Mission and the Structure that enables this Mission to be achieved. If you see The Pub Club as merely getting together to eat some free food and hang out, I think our PIs would agree with me that this is an extra-curricular activity that you should enjoy on your own time and on your own dime! Additionally, running it with this lack of structure will result in an erosion of its identity and value, which will result in a gradual loss of priority in each of your schedules until it disappears. However, if you commit to using the weekly gatherings and special events to “Meet on the Edge of Science” and “Fill the Void,” you are engaging in something that is essential to your training and development as scientists regardless of your career track. So, now it is for you to decide. Is the value you find in The Pub Club worth your personal investment?